"It's time for your meds." I believe that sums up this beautifully. With plenty of dark humour to relieve the edge-of-your-seat tension - and two particularly furrowed, perspiring brows - it's like watching the runaway train heading for the collapsed bridge over a very deep canyon whilst impending-calamity piano music plays at ever-increasing speed and volume. It's a book about manipulation, sanity and power, starring the most sociopathic individuals in the Marvel Universe, all led by the least stable of the lot. 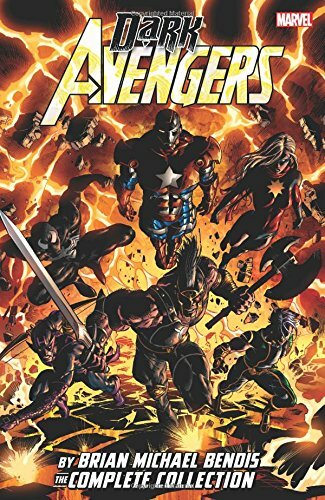 It's a direct follow-on from Warren Ellis & Mike Deodato's THUNDERBOLTS (recommended for its claustrophobic, subterranean sweatiness) which itself was an immediate result of Marvel's original, catastrophic CIVIL WAR. 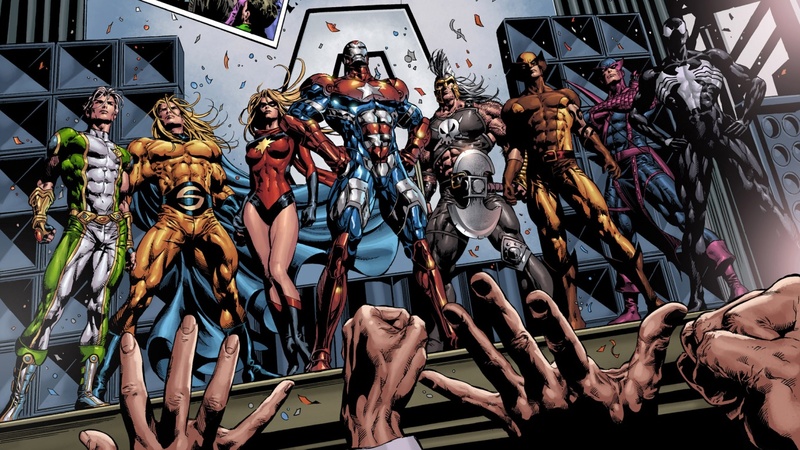 Traditionally THE AVENGERS is Marvel's flagship title, its lofty, squeaky-clean team consisting of the most altruistic available and closely vetted to answer that vocational call. This is its juicy, perverse antithesis, its ultimate corruption, successfully defiling all that should be dignified, honourable, above board and working towards the public's best interest. The closest equivalent I can offer you is America's real-life White House 2017 commanded by its blatantly lying Loony-In-Chief. He's added a new meaning to the term "self-service". 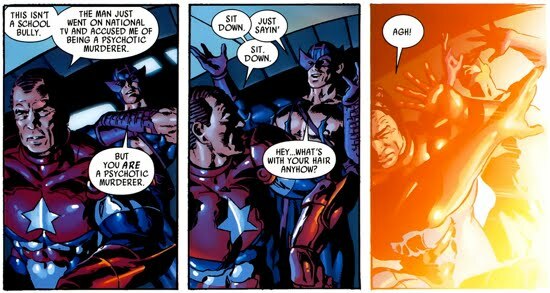 Behold the precognitive powers of Ellis and Bendis, for the parallels are striking! Norman Osborn - the monomaniacal Brillo-bonced businessman, nightmare and seething cauldron of insanity also known as the Green Goblin (who once murdered a woman called Gwen Stacy) - has risen to the socio-political top. Media-savvy, he's duped the world with an entirely unexpected conquest and gone on to persuade the public that he is reformed, so all his sins have been not only forgiven but officially pardoned. He's currently and legitimately in charge of US national security plus all things superhuman. He has even created his own team of fiercely formidable Avengers. They're both fierce and formidable because they are walking, talking monstrosities for whom shoot-to-kill is not just a default setting, it's a pastime and a pleasure. These criminals - lascivious, devious super-criminals - are all seemingly in thrall to Norman Osborn, although some of them may be making their own predatory moves. We have Venom posing as Spider-Man, Bullseye posing as Hawkeye, Moonstone as Ms. Marvel, Logan's son as Wolverine, and Ares the god of war simply because there is fighting involved. 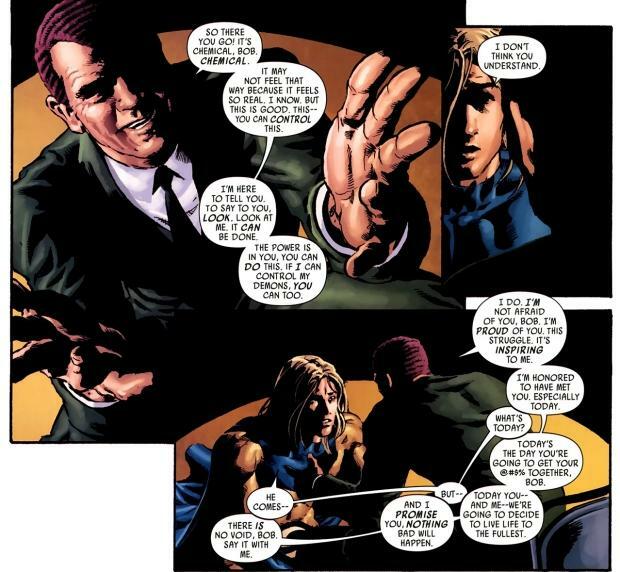 The Sentry remains because the Sentry is mentally and emotionally vulnerable and Osborn has been 'courting' him, for want of a better word. They're both in possession of split personalities so Norman understands. Norman can reach him. Norman has him under control. Norman has the ultimate weapon at his side for Bob Reynolds, the Sentry, could black out the sun. 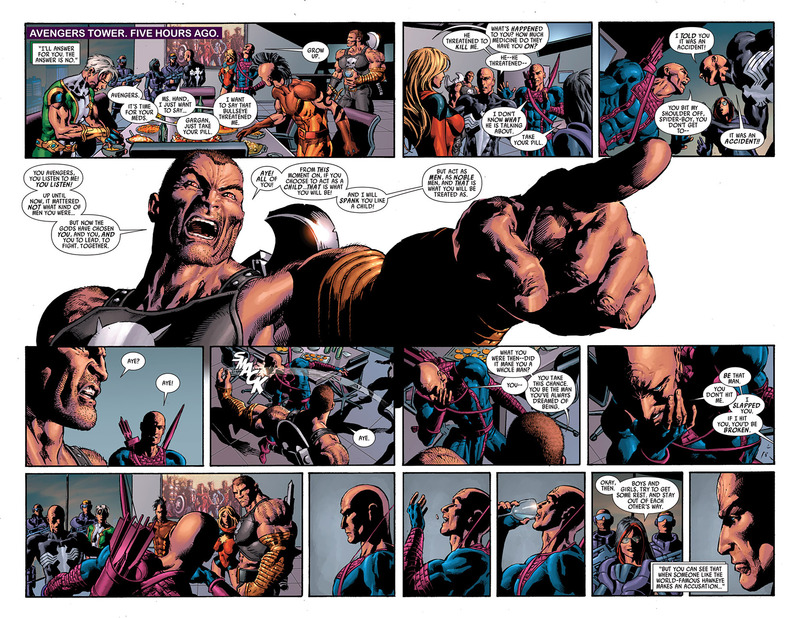 It's not your normal exchange of super-powered fisticuffs by any stretch of the imagination. There are blistering battles and pyrotechnics aplenty during which Deodato excels with a grim, visceral splendour, but they aren't the traditional stand-offs of power sets for we veer into the Biblical and far, far beyond. The curved hips which Deodato likes to emphasise (c.f. Michelangelo's s-shaped teenage lads unfathomably cavorting naked behind 'The Doni Madonna', 1503) are actually apposite here, for Ms. Moonstone is sexually objectifying herself in order to secure her own nocturnal power base within the ranks. I believe this is where S.H.I.E.L.D. 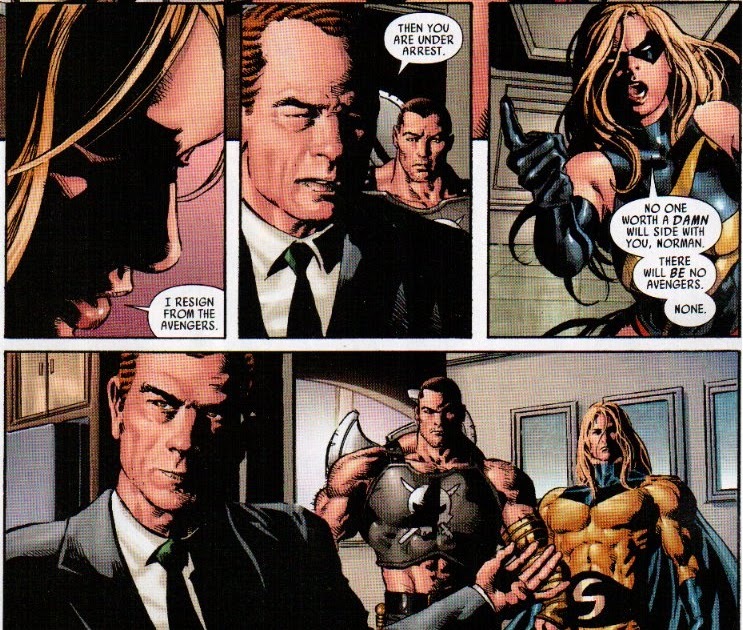 's former accountant Victoria Hand first appeared, here promoted to the equivalent of Norman Osborn's Chief Of Staff, determined to keep a lid on the multiple bubbling cauldrons and - to her credit (and Bendis's) - doing a commendable job of it under the intimidating circumstances. She doesn't fluster, she doesn't panic; she stands her ground and is not without resources of her own. Again to Bendis's credit, her ultimate fate at the end of this day is far from predictable. For we all know Norman's machinations are going to implode spectacularly at some point, and we all know that hubris will be his undoing; it's merely a question of just how much chaos and misery he can cause in the meantime. SPOILER: the answer is plenty.